1.5 What are the most lucrative commercial models to adopt? 2.3 Stem cell tourism: is it a fraud or a worthwhile endeavour? 2.5 What is the potential for market share? 3.4 Globalization and innovation systems? 4.3 So where are the commercial opportunities? 5.3 The future of hESC research? 6.3 The iPS cell industry? Chapter 7: What does the future hold? Promising new developments in biomedical technology such as stem cell science are widely endorsed by governments keen to reduce spiralling healthcare costs, clinicians focused on patient care, and patients demanding revolutionary new treatments. 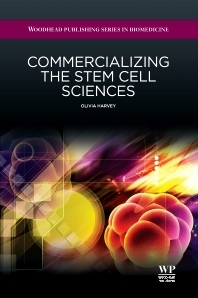 Commercializing the stem cell sciences offers a comparative analysis of the commercial methods adopted in the global stem cell industries. It seeks to establish whether there is an optimum commercial model and to examine what emerging companies can learn from their predecessors. Following an introduction to stem cell sciences and the problems involved in their commercialization, the book begins with a discussion of stem cell treatments from a global perspective, and the role of innovation in the commercialization of biotechnology in general. In the second half of the book, chapters focus on the different strategies that can be employed and their relative risks and values, before a conclusion that looks at potential new developments in the field. Dr Olivia Harvey is currently a Visiting Fellow with the Biopolitics of Science Research Network at the University of Sydney, Australia. She was previously a Faculty of Arts and Social Sciences Postdoctoral Research Fellow and Research Fellow in the School of History and Philosophy at the University of New South Wales, and an Economic and Social Research Council Postdoctoral Research Fellow and Research Fellow with the Global Biopolitics Research Group (formerly of the University of East Anglia), Centre for Biomedicine and Society (now at Brunel University), King’s College, London.